Innovating in the dynamic landscape of teaching and learning. Preparing our future leaders, entrepreneurs, researchers, artists, and teachers to embrace the opportunities of the 21st century requires a common commitment to innovative teaching, classroom technology, and a deep understanding of how students best learn. Our methods of teaching need to evolve to keep pace with today’s student. Undergraduate Academic Affairs builds infrastructure supporting inspired teaching through assessment, access to technology for dynamic classroom experiences, and a community of teacher-leaders to advance effective teaching and learning. Undergraduate Academic Affairs is a campus leader and innovator in ensuring the educational foundations of teaching and learning—classrooms, assessment, and teacher improvement—are sound. 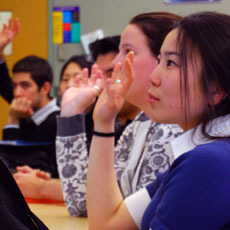 UAA programs contribute to the University’s understanding of how students learn, invigorate best teaching practices, establish and assess a common set of undergraduate learning goals, and steward the physical classroom environment.